While I still don't consider the Mac mini the bargain Apple claims it to be, having a mini is a convenient way to dip your toe in the OS X waters without committing to a much more expensive machine. One trick is finding a good way to fit a mini into your current desk configuration, or (for those trying to create a Mac mini home theater setup) fitting that little white box into an entertainment center. 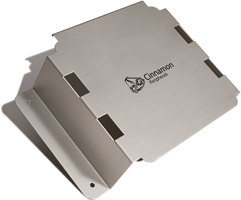 Cinnamon Peripherals solves that problem with the CinnaRack for Mac mini. The rack snugly fits a Mac mini and screws down to a variety of surfaces, getting your Mac mini case out of the way. A bundled CinnaRack for the power supply also neatly keeps the cord out of the way. They've currently got a second edition in progress, which will likely be even better. At $27, the price is right for neatly storing your Mac mini.